Chomp Rock Challenge is the first level of World 6 found in Yoshi's New Island. 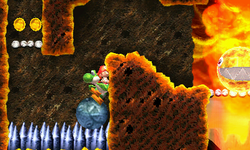 Yoshi starts the level in a lava-themed area with some enemies, moving platforms, and Chomp Rocks. Eventually, he reaches the next area which begins with a Checkpoint Ring and a Chomp Rock which can be used to cross the nearby spikes and reach the giant Arrow Cloud. It leads Yoshi to the Checkpoint Ring and the next area where a Chomp Shark begins to chase him, but hits itself on a hard platform. This leaves Yoshi to go the nearby Goal Ring. Wan! Wan! Wan! Woof! Woof! Woof! This page was last edited on April 15, 2019, at 12:13.